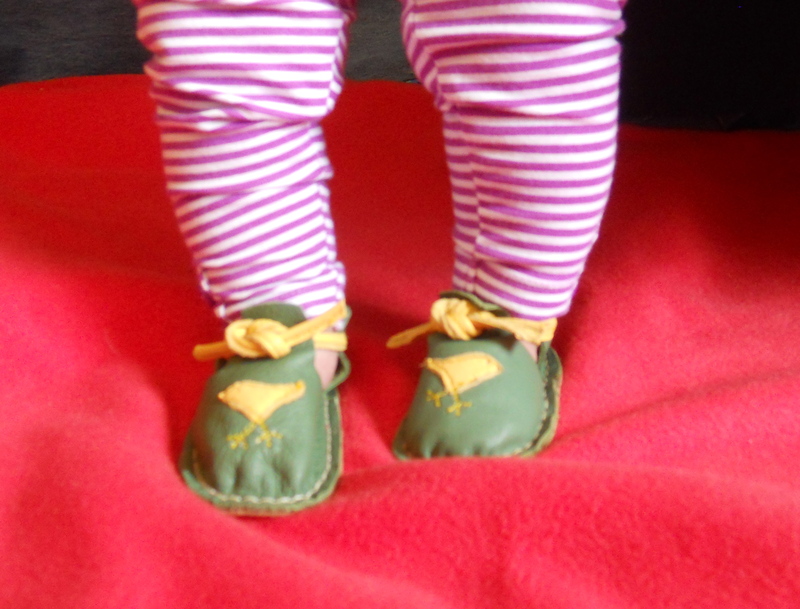 Here’s a photo of a couple of pairs of “First Walker” shoes that my daughter made for members of her “birth board”. (In case you don’t know about this phenomenon, it’s a way for pregnant women to communicate on the WEB with others around the country who are expecting babies around the same time). Baby shoes made from T-shirts! There was a recent request on a forum I’m on for prom dresses for girls who need them, and my mind went to the “T-shirt wedding dress” I had seen in a book I frequently consult, “Generation T – 108 ways to transform a T-shirt”. Making things from T-shirts is my second most-favorite thing to do. When working with T-shirts I like to incorporate stitching techniques that I learned from the books of www.alabamachanin.com. Visiting the facebook page of the author, Megan Nicolay, www.generation-t.com, inspired me to make a T-shirt baby shoe that I could post on her site. 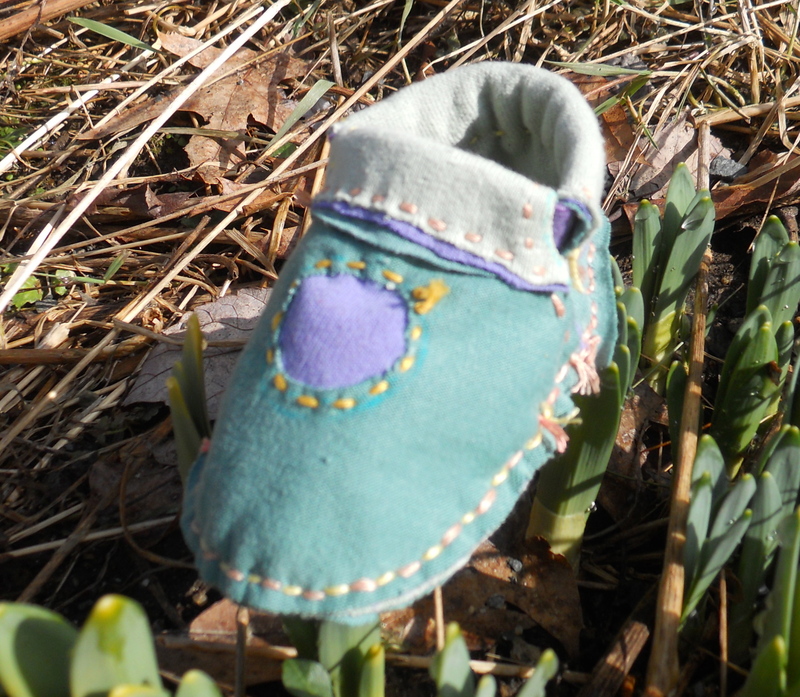 I had not made any “T-shirt baby shoes”, so, using the tutorial for the “First Walker” baby shoes that was recently posted on my blog, I tackled this assignment and was pleased with the results, seen here. Using Natalie Chanin’s stitching technique, the threads are knotted on the outside, and the running stitch is used by the miles. I used three layers of T-shirts, from scraps left over from a dress I am making for my 4-month-old granddaughter Millie. Now she’ll be “matchy-matchy”! If I had some double-sided sticky interfacing I would have used it to give the shoe a little more “body”. Now that I have a grandchild, I will be learning a lot more about what size of shoe a child wears at a certain age, and what fits and what doesn’t – here’s Millie in the smallest-size shoe from How to Make SimpleShoes for Children with your own two hands!, which is for a 3 1/2″ foot. She’s four months old. Of course she’s not walking, so the shoes are not functional, although they may be helping to keep her feet warm. I used the pattern from said book, which is similar to the First Walkers pattern featured in my most recent tutorial. In fact, the folded-over part of the First Walkers pattern can be eliminated, and holes for a thong or elastic to pass through can be punched along the top edge, as is shown here. Most all the patterns I make can be adapted in many ways. I am gratified by the number of comments I have received about the tutorial; I belatedly realized that when I copied the tutorial I had written for Living Crafts, I also copied the note about, “free pdfs of the children’s shoemaking book will be sent to five of the readers who comment on the article before sunday midnight”. Oh well, I’m happy to send them to the commenters here, and I learned the value of offering freebies! I’ll do it again soon. In fact, I’ll do it right now.. I WILL SEND OUT FREE PDFS OF THE CHILDREN’S SHOEMAKING BOOK TO ANYONE WHO SENDS ME A PHOTO OF THE FIRST WALKERS THEY MAKE BEFORE MIDNIGHT THURSDAY 3/28! I consider those who respond to be my experimental team – I want to know what worked for you with regard to the pattern, and what might not have, what kinds of material you used and how it was to work with, and any tips or comments you’d like to share. How many pairs of shoes does a child grow out of before he or she is fully-grown? I don’t know the number, but I do believe if we were making some of those shoes, the cost of raising a child would plummet (a slight exaggeration) and our children’s feet would be healthier. And, if we use recycled materials to make them, our children’s shoes would have a smaller “footprint” on the earth. 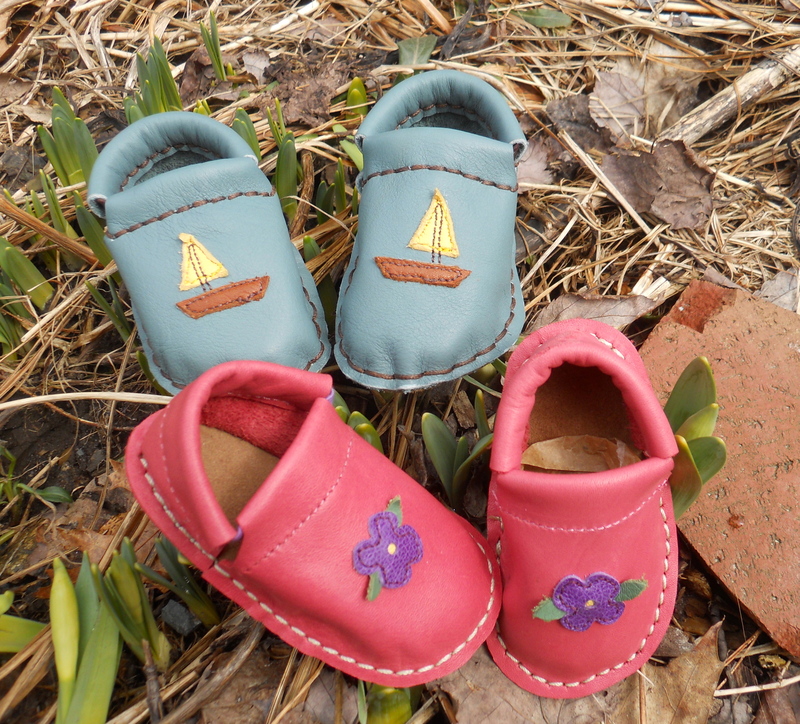 Here’s a pattern and directions for making simple children’s shoes in a “first walker” size. The pattern can be reduced or enlarged on a photocopy machine by about 8 percentage points without becoming too distorted to be usable. I think these shoes make great baby shower gifts. There will, no doubt, come a time when these “first walkers” will fit perfectly. Consider checking the sizing of this pattern by making a “mock-up” from inexpensive felt to try on your child before cutting into your actual shoemaking material. 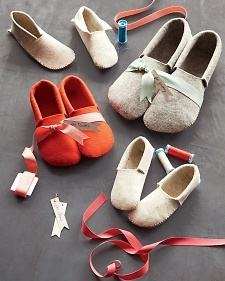 Uppers: Make the upper parts of the shoe from thrift-shop leather goods, leather or fabric upholstery remnants, hand-made felt or felted wool coats, recycled denim or canvas. 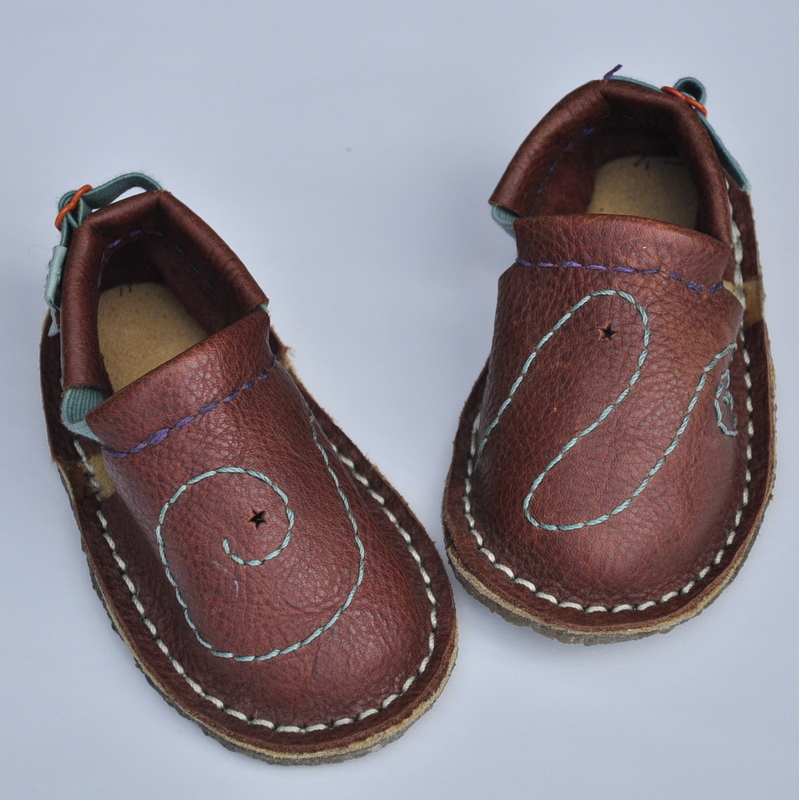 Soles: To make children’s footwear as flexible as bare feet, there are a couple of materials I use. For those who want their children’s shoes to be made of all natural materials, natural rubber soling is available on my etsy shop. A child wearing shoes with natural rubber soles can feel the topography of the earth, yet will be protected. This soling must be stitched with a stitching awl as described below, as holes pre-punched in it seal right up. Another option, readily available and thin enough to provide that barefoot feel, but in no way “natural”, is the grey hall-runner available at home building centers. It has rubberized material on the backside that can serve as soling. If you put a few layers of fabric or felt, or a single layer of leather over the fuzzy side-up, the texture won’t be noticeable underfoot. A third option is to cut them from thrift store leather goods. If you use leather, I suggest that you use two layers, with the “fuzzy” sides facing out. The fuzzy side on the bottom provides traction and the one on the top absorbs perspiration. This is the option I have used on the sample pair of shoes shown here. If you prefer rubber bottom soles, cut them from bicycle inner tubes. Thread: I use heavy-duty waxed braided cord from Tandy Leather. Four-ply waxed Irish linen or stitching-awl thread can also be used. It’s best to use a synthetic thread when stitching the upper to the sole, as organic materials deteriorate when in contact with the ground. Elastic: For this size shoe, I use six inches of 3/8″ elastic for running through the channels. To get the elastic through the channels, make a little tool from a piece of plastic milk carton, about 5″ long and 3/8″ wide. Cut a little slit at one end. Use like a sewing needle or bodkin to pull the elastics through the channels. To make colored elastic, I use permanent markers to “dye” the elastic in the area where it is exposed, between the toe piece and the heel piece. The tools for making these shoes are simple – a decent pair of scissors, a “scratch” awl from the hardware store for punching stitching holes, a couple of layers of corrugated cardboard to place below your upper material when punching holes with the awl, a glue stick, a marker appropriate for your material, permanent markers for “dyeing” the elastic and a couple of tapestry needles for stitching leather shoes, or sharp needles for stitching fiber shoes. If you want to make proper round stitching holes in leather, the 00 round-hole drive punch from Tandy Leather, # 3777-33, is the tool for you. You will need a plastic cutting board to place under the leather piece while punching, and a rubber mallet or other non-metal hammer for pounding on the punch. The little “spring punch”, # 3236-00, from the same source, can punch holes nicely if they aren’t more than 1/2″ or so from the edge. A stitching awl (Tandy Leather # 1216-00) can be used for stitching the upper to the sole. A video showing its use can be seen atwww.simpleshoemaking.wordpress.com. left to right: spring punch, stitching awl, 00 drive punch, scratch awl, rubber mallet. Make the soles: If your material is sturdy and sueded on both sides, you might only need one layer for soling. If your soling is different, cut out the leather or fiber topsole, then use a glue stick to adhere it to the bottom sole material. When the glue has dried, cut out the bottom sole to match the topsole. Mark the stitching holes onto the topsole with silver pen or permanent marker. Cut out the upper pieces: Draw around the toe piece and the heel piece onto your upper material, then cut the pieces out. Be sure to flip the patterns over when drawing the second shoe. Punch out the stitching holes: Punch out the stitching holes on the patterns and transfer them to your shoe pieces. Also, mark the center of the heel and the toe, and the location where the heel piece meets the toe piece, indicated on the patterns by a spiral. On fabric or felt, use whatever mark-maker that is suitable for your material, to mark the location where stitches should go through the fiber. For leather, I like to use a silver gel pen to mark the location of stitching holes, it usually comes off with soap and water applied with a cloth. After marking, punch out the holes. To accomplish this, either place your shoe part on a few pieces of cardboard and punch down with an awl, or use the 00 punch as described above. Make the channels for the elastic to pass through: if you are using leather, punch out the stitching holes along the two lines shown on the patterns. If you are using felt or fabric, you have made stitching marks. You can turn the channel either to the inside or the outside. Use the “simultaneous running stitch” to stitch the channel. For the simultaneous running stitch, cut a piece of thread about four times the length of the distance you are going to stitch, and put a needle on each end of the thread. For stitching fiber shoes, attach a sharp needle to each end of the thread. Stitch into the first mark on one end of the heel piece, then down through the corresponding mark on the sole. Bring that thread back up in the second mark in both sole and heel piece, and tug on your threads so they are the same length. Pass the second needle down into that second mark, while holding the thread that is already there to the side, to protect that first stitch from being split. Give a good tug on both threads after each stitch to create a nicely-seated seam. Hiding knots: Each time you stitch, at the end you have two loose threads. To tie the threads in a hidden knot, put each needle through only one layer of your shoe material so the threads meet inside the area stitched. Tie a tight square knot, then run the ends of the threads under a few stitches before cutting them off. When working with leather, you will have punched stitching holes. Proceed as described above, and for the neatest appearance, develop a pattern of which thread goes into the hole first (from the top or bottom) and whether the second thread goes to the right or left side of the first. Consistency is the key – and that’s why your work won’t look as neat if you make a running stitch with one thread all along the seam, then fill in the gaps with the other thread; you’re missing that tug on both threads after each step that makes the threads grab each other and settle in. Embellish: Embellish the shoes if you like – embroider, applique, reverse applique, stamp, paint. Since I made shoes from leather, I punched holes along the decorative lines on my pattern, about 3/16″ apart. I then transferred the marks to my toe piece, punched them out, then stitched with 4-ply waxed Irish linen. It’s fun to add a little touch of embellishment to the heel piece also. Run elastic through the channels: Use the plastic bodkin to pull the elastic through the channel so it emerges at the other end. Put one end of the elastic through the slit, then pull it all the way through with your plastic strip. Once the elastic is through both channels, check for twisting, then overlap the two ends about 3/8″ and stitch them together. After stitching, pull on the elastic until the stitching is hidden inside a channel. Stitch toe-piece and heel-piece to the sole: Now that the uppers and soles are complete, stitch the shoes together. I usually start stitching on the inside of the shoe, where the heel piece meets the toe piece. Cut a length of non-degradable thread about four times the distance around the shoe, which is about 12 inches x 4 = 48″. For fiber or leather soles, use the “simultaneous running stitch” described above to stitch the shoes together, unless you are using a natural rubber sole. As described above, a stitching awl is needed to stitch a natural rubber sole to the shoe. In the toe area, the distance between stitching holes or marks is greater on the toe piece than on the corresponding holes on the sole; this causes the toe area to “pop-up” and not press down on the child’s toes. I usually wet leather when stitching in this area so it’s moldable, and do my best to gather the leather so it doesn’t overlap on itself. If you are concerned that stitching through the soling might result in these stitches wearing out sooner than you’d like, remember that the part of the foot that touches the ground is the part you can see when walking barefoot in wet sand. However, if your child does wear through stitches, you have the skills to re-stitch! When you’ve stitched all around the shoe, hide your knot as described above. Spray water inside the toe piece of a leather shoe, and stuff it hard with fabric or paper bag scraps. Let it dry for a few hours until it keeps a nice, rounded shape. For twenty five years, Sharon Raymond has had a passion for making simple footwear. She first learned shoemaking when living in England in the early 1990s; since then she has written seven books about shoe making, and taught the craft of shoemaking to hundreds of students. She delights in learning, then sharing, how to make simple footwear, often inspired by ancient and far-away cultures. 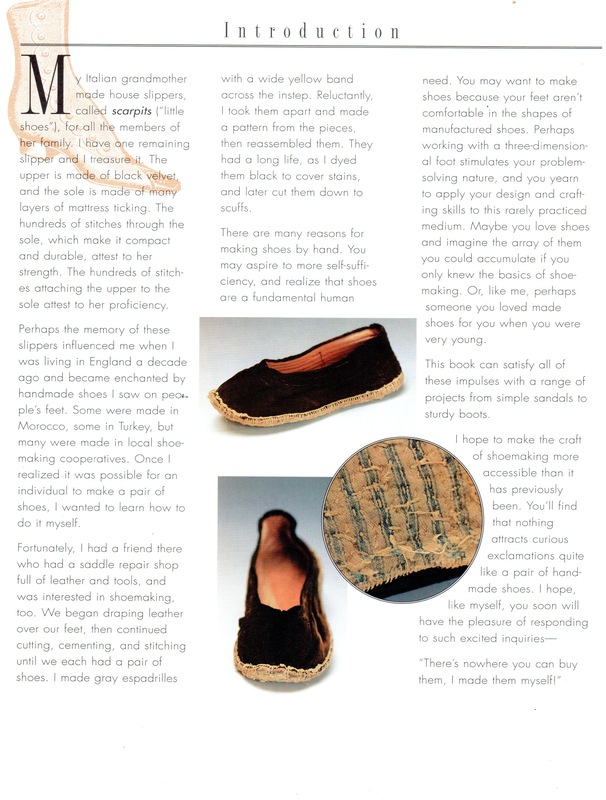 Sharon disseminates her joy of shoemaking from her home studio in the Pioneer Valley of Western Massachusetts. Sharon will send out a PDF of her book, How to Make Simple Shoes for Children with Your Own Two Hands! to five lucky winners! Enter a comment on this post by Sunday March 17th, Midnight PST for a chance to win.